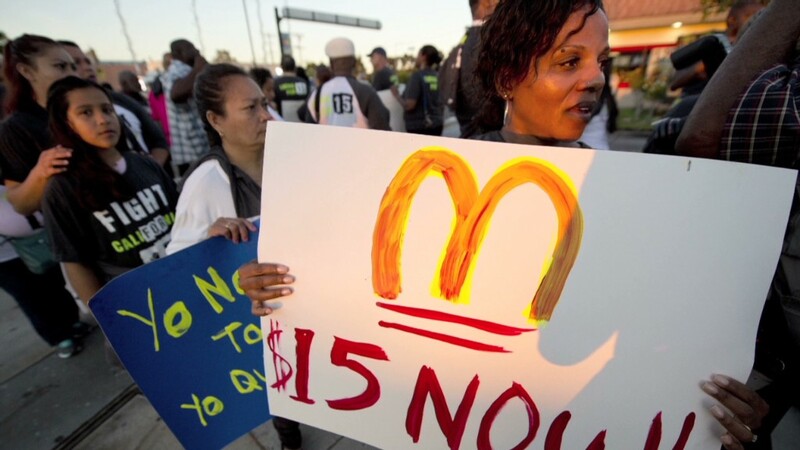 McDonald's workers have been protesting for higher wages and better hours since last November. 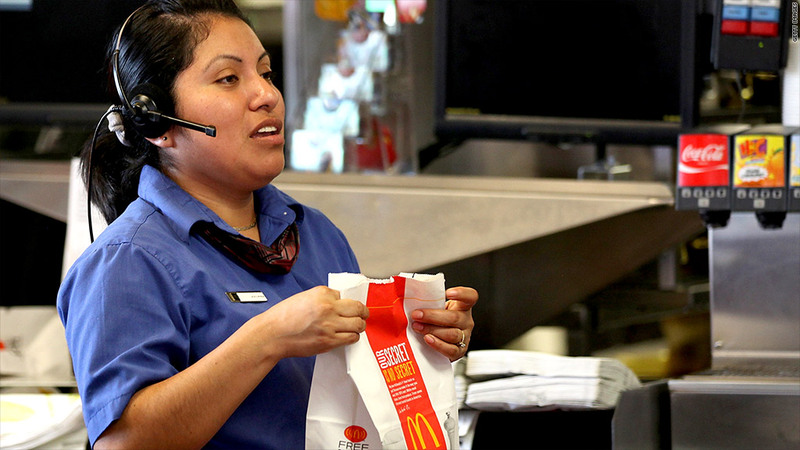 McDonald's workers should have no problem qualifying for government programs like food stamps and heating assistance. The hamburger chain pretty much admits that in a call made by a worker to "McResource"-- a helpline set up for its workers. The advocacy group Low Pay is not Ok recorded a phone call made to the helpline by one McDonald's worker Nancy Salgado. The group circulated an edited video of the recording. McDonald's said the video was "not an accurate portrayal of the resource line" because it was "very obviously" edited. However, CNNMoney reviewed the full recording of the call. Salgado, who has worked at a Chicago McDonald's for 10 years and makes $8.25 an hour, asked the McResource representative a number of questions related to getting assistance to pay for her heating bill, her groceries and her sister's medical expenses. Salgado told the representative that she was recording the call for her sister. The helpline operator never asked Salgado how much she made per hour, and how many hours per week she worked beyond the fact that she was a full-time employee. But she said that Salgado "definitely should be able to qualify for both food stamps and heating assistance." The representative then pointed her toward a number of resources in Chicago, such as food pantries and a program that would help cover some of her heating bill. She said she would email her specific phone numbers and programs. The operator also explained that the McResource line is available to help McDonald's workers who need help navigating the process of getting public assistance. The helpline's phone number is posted in fliers at many McDonald's locations. McDonald's said in a statement that "the McResource Line is intended to be a free, confidential service to help employees and their families get answers to a variety of questions or provide resources on a variety of topics including housing, child care, transportation, grief, elder care, education and more." But the line is not open to all McDonald's workers. Franchise owners need to pay for the service in order for their employees to use it. Salgado's franchise owner in Chicago, for example, had not paid for the service, even though she called the helpline. The operator said that none of the Chicago franchises had paid for it. "We can be a good program," the operator said. "We can do a lot of the leg work that takes a lot of the stresses off of you making a million phone calls trying to find services." News of the McResource line comes a week after a report found that more than half of fast food workers have to rely on public assistance programs since their wages aren't enough to support them. A separate report by the National Employment Law Project released on the same day showed that McDonald's alone was responsible for $1.2 billion of that $7 billion alone. The recorded phone call supports what the reports found and also the claims of hundreds of fast food workers that their pay is too low, they don't get scheduled for enough hours and they get no benefits. Since last November, workers have organized protests around the country, including New York City, Los Angeles, Memphis and Detroit calling for a minimum wage of $15 an hour and the right to organize without retaliation. Earlier this year, McDonald's came under fire for releasing a budget planning guide for its employees. The sample budget it provided didn't account for either food or gasoline, a big expense for low income workers. The budget also left room for an income from a second job, which many called an admission by the fast food giant that its workers can't live on wages from one job at McDonald's.